Saturday was our annual Ward Halloween Carnival, below is a link to some photos taken from it. David is a "Lightning McQueen Racecar Driver" and Spencer is "Tigger". 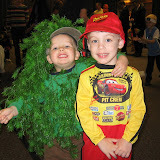 The little boy dressed as a tree in the photos with David is his new best friend, Jacob.